Passport is one of the important official document issued by the Indian Government. The Passport is known to be a ticket to travel the world. It serves as an Identity Proof as well as the Age Proof. In this article, we are going to discuss the importance of Passport, Renewal of the Passport and how to do the Passport Renewal in India, documents required for renewal etc. If you are traveling abroad then you have to carry your Passport. A passport does not guarantee entry to any country, but it is a required document to go abroad. Furthermore, the validity of an Indian Passport is 10 years. After the expiration of the validity, you should renew your Passport. Passport is accepted as a Proof of an Identification, Address, and Age in India. If the applicants want to apply it online, then they can perform the renewal process online. They can also make the payment online and book an appointment. Visit the Passport Seva Kendra Site and register for the Passport Renewal online. If you are already a registered user, then log in using the credentials. 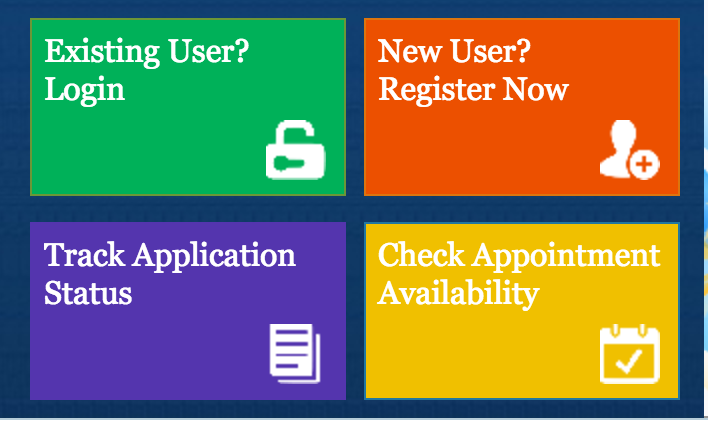 If you are a new register, then click “New User” and “Register Now”. Select the nearest Passport Office based on your current address. To register, you need to provide the basic details which include your name and date of birth. Create a Login ID and Password and set a hint question and register. You will then receive an e-mail to the address you have provided. A link is sent to your e-mail. Activate your account using the link. Once you are logged into your Passport Account. Click on “Apply for Fresh Passport/ Re-issue of the Passport”. There are two options available for filling the application form. You can both download the application form in PDF Format and fill it offline or you can fill the form online. Fill in the current address. Update the details if in case you want to make any change. You need to provide any two local references. Provide their full name, phone number, and address. If police verification is required, these people will be contacted. For online application procedure, you have to click on submit to complete the application. If you are using the PDF format make sure that you enter your city or village. Click on validate and save the form. You need to upload this document to the same page from where it has been downloaded. The details will be entered automatically in the online form. Recheck and verify all the details before clicking the submit button. The only thing which you can edit after submission is the changing of the Passport Office. For renewal of the Passport application, there is no Payment required. Select the available slot according to your convenience. You can also choose the option to choose the nearest Post Office. Once your slot is confirmed, you can schedule your appointment. You can visit the Passport Office 15 minutes before the slot timing. A group number is allocated and it is mentioned on your form. When your number is called, you can go to the next room and the application process is carried on. If you sign up for SMS Service, then you will receive all the updates about the Passport Status. Once you have successfully completed your process and submitted all the documents then the validity will be changed on the passport and the same booklet will be returned to you. Self-attested copy of first and last two pages of Passport. Self-attested copy of ECR and Non-ECR Passports. Self-attested copy of Page of Observation, if any made by the Passport Issuing Authority. Self-attested copy of the Validity extension page, if any in respect of short validity passport. Proof of the documents which eliminate the cause of issuance of Short Validity of Passport. What is the Purpose of the Renewal of the Short Validity Passport? The students who are appearing for different exams like SAT, TOEFL etc. Indians who are residing in Abroad and wish to travel India. Non-delivery of Passport due to the loss of transit. In case the applicant has a criminal case pending in the court. Renewal of Passport: The Renewal of the Passport is performed when you want to extend the validity of the Passport. Like for an example if you’re Passport has a short validity if 2-5 years then you can extend the validity period of the Passport. This process of extending the Validity of the Passport is called as Renewal of Passport. Re-Issue: The Re-issue of the Passport done when you need a complete new Passport. You will receive a new booklet number and Passport Number. Change in the personal details. After the renewal of the passport, the validity of the Passport becomes 10 years. For the renewal of the Passport, you will not receive any new booklet. Only the validity will be changed in the passport and the same passport will be returned back to you. You need to carry all your original documents to the Passport Office for your appointment. But in case of the submission process, you need to submit only the self-attested copies of your documents. The original documents are considered only for the verification purpose and will be given back to you after verification. You cannot make any corrections online, once the application form is submitted. You can visit the Passport Seva Kendra and ask the Citizen Service Executive to make the change if required. There are no charges for the Renewal of the Passport. After applying for an Indian Passport, it takes a certain period of time to get delivered at your doorstep. In the meanwhile, you can still track down your Passport Application Status to keep yourself updated. An Indian Passport is an essential official travelling document that is issued by the Government of India that certifies your identity. With the help of an Indian Passport, you can visit any country without any restriction. For applying for an Indian Passport you need to undergo certainly quite a lot process of documentation and verification schedule. There are different types of Passport on the basis of your designation. For applying for an Indian Passport there are two methods-either you can apply it online or offline. For applying it offline you need to download an e-form which is available on the official website of the Indian Passport. it is categorised as fresh/reissue passport, police clearance certificate, identity certificate e-form, surrender certificate e-form etc. You need to download the e-form and upload it back on the website along with certain documents. the user must have the latest version of Acrobat Reader. For filling for the passport online you need to register yourself in the official website of the Indian Passport. After registering successfully you are provided with a user ID and a password. This User ID and the Password is meant for logging in and filling the further details required in the form. Then comes the section of Payment and Schedule Appointment where you need to make the payment, if you are paying it offline then you need to download the challan form that is available on the website. After making the payment you need to schedule an appointment for the Passport Seva Kendra. You can select the PSK offices and dates according to your suitability. The Passport Seva Kendra is a place where your document verification are done. This is basically the Final Step/ Procedure of the Application Procedure for an Indian Passport. NOTE- You must have the latest version of Acrobat Reader (9 or above). For checking your application status, the first thing you need to do is to visit the official site of the Passport. At the left side of the page, there’s an option for Track Application Status, click on that option. Select Application Type: Here, you need to mention the type of application you have applied for. There are mainly 4 options to choose- Normal Passport/ Police Clearance Certificate (PCC), Identity Certificate (IC), Global Entry Program. Or Right To Information (RTI) Or Diplomatic/Official Application Or Surrender Certificate. File Number: This is a 15- letter alphanumeric number mentioned on the Acknowledgement Letter. This letter is issued at the end of the application process at the Passport Seva Kendra (PSK) or at the exit counter. Date of Birth: Mention the required date of Birth that you have given during the process of filling the application form. After giving the required details, click on the Track Status. You can even track down your passport status by contacting the National Call Centre which is a toll-free number. You need to provide your file number as well as your date of birth to the customer representative. You can find queries in the feedback section of the Passport Portal. The Passport Seva Kendras have the helpdesk which will provide you the information regarding the Passport Application Status and inquiries related to the Application status and updates. You can also send your queries through e-mail. You can even visit your nearest Passport Office or call the PO. You can also check your application status through the SMS. You can opt for a Premium SMS service where you will receive the updates of your Passport Application (up to 9 status updates). This will charge Rs 30 which is charged at the time of the enrollment. You can send a text message by typing in the number along with space and writing down the 15 digits alpha-numeric file number to 9704100100. This is an another way of getting information of your Application status. This app runs on every leading platform like Blackberry, Android, IOS, and windows. You can download it in Google Play Store, Blackberry World, App Store and Windows Phone. All you have to do is to give the file number as well as the Date of the Birth. Status of Passport Application can also be tracked using the mPassport Seva App. Hence, these are the certain process through which you can track down and get frequent updates on the Passport Application form without waiting in the queue and wasting your time. Have you just recently shifted to a new city? And you’re finding out how to get your address updated on your passport. Okay, so here’s the process of how you can change your address in the passport. You have to get the passport reissued if you want to get your address changed in it. The process of reissue of passport is given below. This is the first and foremost step for applying for the change of address. Create an account in the Passport Seva Online Portal Website. After creating an account, you need to log in and click on the Apply for a new passport/ Reissue of the Passport link. If you already have an account just log in. You can either download the e-form which is available in XML- format and fill in the application (offline) or II) You can fill in the application through the website (online) also. If you have downloaded the XML file, then you need to upload it again after the completion. If you have filled in the application online, then you just have to click on the submit when you’re done. Make sure that you change your address into the current address that you are living presently. NOTE: The amount of the application form after payment is non-refundable. After choosing the payment mode, you can schedule your appointment. After the successful payment, select “Schedule appointment”. If your payment is processed, you can “Track the Payment status”. If you have paid using a challan, then wait for 2 days for its process from when you deposit money. The status will be updated with the “Track Payment Status”. Once the payment is successful you’re ready to schedule an appointment. Select the nearby passport office or Passport Seva Kendra (PSK) and the slot that is convenient for you. After the payment and scheduling an appointment you will receive an application receipt, print out a copy of it and keep it safe until the appointment. Go to the respective Passport Seva Kendra or Regional Passport Office on prior to the date of the application. A printed copy of the on-line or off-line filled application form with the Application Reference Number mentioned on it. The application receipt- the application receipt that you have received at the end of the applying of Passport procedure. Photocopies of the first and last pages of the Old Passport. Certificate from the employer from the reputed companies on their letter -head. Photo passbook of the running bank account. Documents for Minors: Along with the above-listed documents, the minor also has to submit a declaration on a plain paper, according to the New Indian Passport Rules. There is no requirement of attestation. This is also applicable to each and every applicant. Documents required for the Government/PSU/Statutory Organization: Along with the above- listed the documents, the applicant must submit a No-Objection Certificate (Annexure “M”) or Prior Intimation letter (Annexure “N”). Documents Required for the Retired Government Official: Along with the above documents, the applicant needs to submit the Pension Payment Order. That’s it. Once you reach the Passport Seva Kendra Office or the Regional Passport Office you can change your passport address to your current address. Carry the documents along with you. This is a bit time-consuming process and it may cost you an extra charge so make sure you take your correct address details and other information as well. For a quicker processing of your passport, you can choose for Tatkal Option instead of the Normal Type Application Form. The fee charges for this is a bit high.